.. for Bradley’s ‘Pet Day’ and she loved it !! Jeanette and family don’t have a pet and as Bradley has grown up with our dogs, Robbie and Jackie, we thought it good idea for me to take Jackie. I would have loved to have taken Robbie as Robbie would have absolutely loved all the attention but it would have been too much for ‘the old man’, so I took our little Jackie – whose not that much of a ‘spring chicken’ … she’s 10 !! Bradley was delighted !!! Only four dogs went along to his class that day .. no other pets .. I thought there would be hamsters, mice, rats …. !!! There were other dogs waiting outside the other Grade 0’s … some small, medium, large and extra large !!! I carried her passed the ‘extra large’ ones !!!! All the other children in his class brought photographs. Our little Jackie was a star!! She was so well-behaved that we were the last up !!! 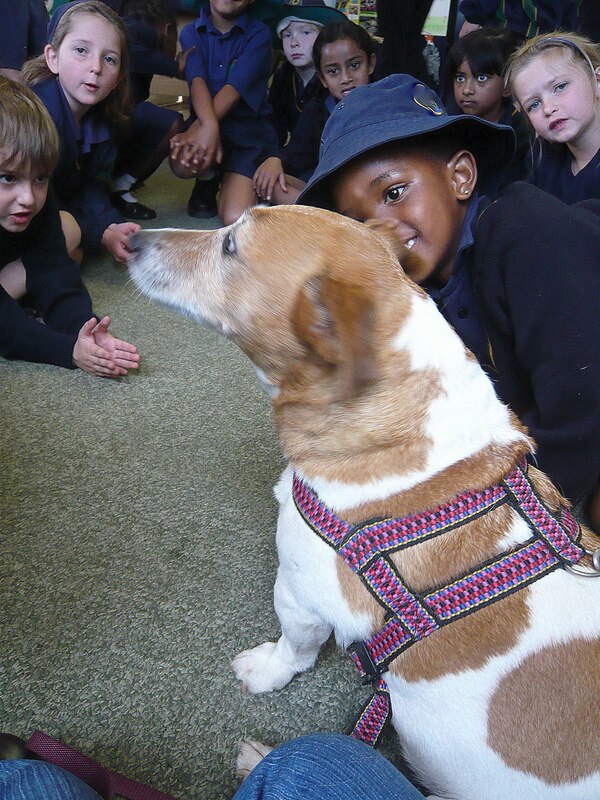 She sniffed around the classroom in between sitting quietly waiting our turn …. Oh yes … very proud of our little ‘girlie’ !! Too Cute!!!! Well done Avril!!! what a great day for all…you are a great Grammy! LOL, he wouldn't stop talking about it, thanks Mom!